I’ll admit I didn’t read through the entirety of the gigantic budget document Louisiana Gov. John Bel Edwards presented to the Joint Legislative Committee on the Budget yesterday, but I did sit through most of the presentation Edwards’ Commissioner of Administration Jay Dardenne made to the JLCB on it. Which probably makes me more qualified than most to offer an assessment of what’s in this thing. 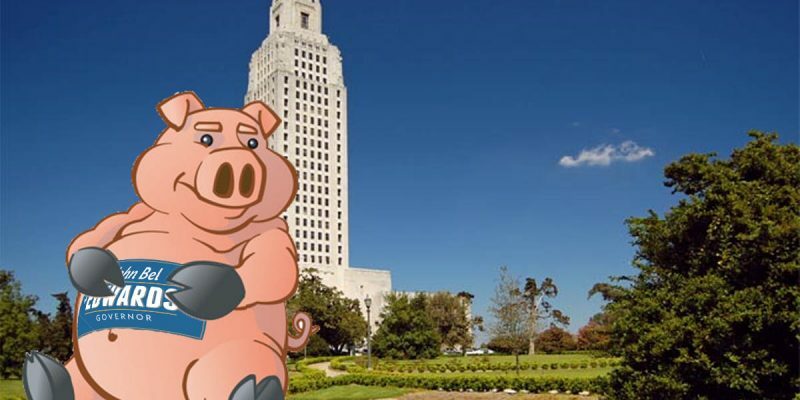 This is the Louisiana budget, after all – there may be no more opaque, boring, in-the-weeds subject in American politics than what the worst-run state in America does with tax dollars tumbling into its coffers. And with Edwards it’s already known that his budget is not presented in good faith. It’s presented in an effort to create political pressure for tax increases. Always has been, always will be so long as he’s operating the chicken coop outside of the Governor’s Mansion. Higher Education – It delivers an 80 percent cut to the TOPS program, which as we’ve discussed has long been a tactic designed to convert the mostly anti-tax, Republican parents of TOPS awardees into pro-tax special interest hogs at the trough by delivering them an unforeseen, ugly hike in tuition costs unless taxes are raised to pay for the program. TOPS is funded at some 20 percent in Edwards’ budget, taking a hit of some $233 million. Edwards also cut the GO Grant budget from $26 million to $13 million, halving the amount of money to pay for poor kids to go to college. And he also is cutting some $26 million from the general fund appropriations to higher education. Government-funded hospitals would lose $769 million. They’re primarily used to provide health care for the poor and uninsured and include University Medical Center in New Orleans. Edwards would cut $189 million from these hospitals, causing them to lose an additional $500 million in federal funding and $51 million in money the hospitals generate themselves. The state would eliminate its Pediatric Day Healthcare program. About $11 million in state funding would be cut, causing a loss of $30.3 million more in federal funding. Mental health rehabilitation services would be almost eliminated. An $18 million cut in state funding would result in a loss of $32 million more in federal funding. Substance abuse services would lose $26 million in state funding, leading to an additional cut of $48 million in federal funding. Long-term personal care programs, which allow people to stay in their homes, would lose $56 million, causing an additional loss of $104 million in federal funding and other sources of revenue. Several types of waivers that provide services for people with disabilities — including children — would be cut. Of course he went after the NOW waivers. He always goes after the NOW waivers. He does that to set up the narrative that if taxes aren’t increased he’ll have no choice but to put the developmentally disabled kids out in the swamp for the alligators to eat. Interestingly, there is nothing in the budget involving charging a co-pay for emergency room visits, or imposing a work requirement for Medicaid recipients who are able-bodied and childless. Edwards had said he’s interested in the latter, and there would be lots of support for it across the aisle, but naturally he didn’t bring it to the table – another dead giveaway this budget is a bluff. Next up is another performance by Department of Child and Family Services Secretary Marketa Garner Walters to warn of the orphans getting heat stroke this summer as they sit in broken-down cars in which they’re being transported. Yes, she actually warned of that possibility in the 2016 Parade of Budget-Cut Horribles. Sheriffs And District Attorneys – There is nothing which more makes state legislators quake in their boots than the prospect of a political war back home with the local sheriff or DA. The sheriff and the DA are the key players in the local courthouse mob which still controls who’s elected to the legislature in most of Louisiana, and they’ve monetized that power by demanding a nice cut of the state’s treasury every year – and that swag is the safest appropriation the state makes. Until John Bel Edwards came along, that is. The current budget contains $96 million in cuts to local law enforcement, including stiffing local sheriffs housing state prisoners and running work-release programs by some $34 million in reimbursement, another $10 million for holding parole violators and chopping $26 million from state subsidies for district attorneys. Now, understand two things. First, it’s entirely appropriate to cut state subsidies for local law enforcement, as sheriffs and DA’s have the ability to secure local funding from local taxes. In the rest of the country that’s how it’s done and it works better than the way Louisiana does it; that local tax money carries with it local accountability, and if a sheriff or DA gets caught stealing or wasting that money they’re usually not long for their job. Except this isn’t a subsidy; this is reneging on an agreement to pay sheriffs to house state prisoners. And second, because it’s such a patently dishonest slap at the sheriffs it’s a dead giveaway that this isn’t an honest budget. Edwards knows damned well this won’t make it through the legislature, and in presenting it he’s conscripting the sheriffs to come to the Capitol and lobby for funding. The whole budget reads that way. Republicans on JLCB in yesterday’s hearing knew what this was and weren’t enthused. Sen. Conrad Appel cross-examined Edwards on his demand for a billion dollars in new taxes and got the governor to say that he thinks a billion-dollar tax increase would actually be good for Louisiana’s economy. And Sen. Sharon Hewitt wasn’t very impressed with Edwards’ contention that he’d already made $600 million in budget cuts, noting that the state-funded portion of Louisiana’s general fund budget had gone from $8.7 billion to $9.4 billion between 2015 and today, and that’s an increase rather than a cut. Edwards’ response was more or less gobbledygook, which he punctuated by popping off an “I can explain it to you but I can’t understand it for you” to Hewitt. She called that “insulting,” which was the truest part of the exchange. So what ought to happen with this? Well, there will be some $200-250 million in additional state revenue realized as a result of the tax reform plan passed in Washington in December. The legislature ought to use that money to restore the TOPS cuts. Otherwise, with perhaps a few tweaks moving money from one place to another the legislature ought to pass this budget more or less as is. Do that, and Edwards has no leg to stand on when he vetoes his own budget, which he gave an indication yesterday he will do. Force him to own up to his tactics. And for heaven’s sake don’t give him any more tax money to spend – he’s already shown he won’t spend it in good faith.